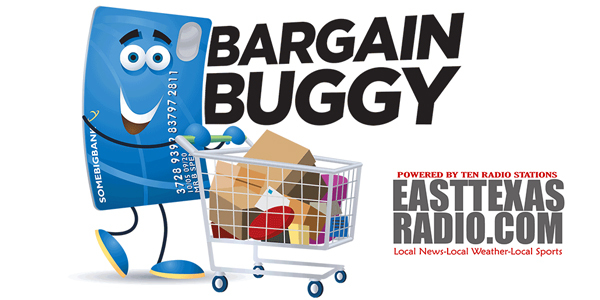 East Texas Broadcasting is excited to present Bargain Buggy! It is an easy online shop where you can buy quality local goods, such as food, auto services, spa services, etc. at a discount price. The site is pretty simple but most of the information appears at the bottom of the page below our little mascot. So, if you don’t see something directly on your screen, scroll down. You will need to scroll to the bottom to fill out registration. You can see participating businesses and the items we have on sale, but in order to purchase, you will need to register. Be sure the email address you sign up with is the one attached to your cell phone so you can use it to redeem your certificate. We do not keep your credit card information on file. Nor do we sell or share your personal information. When you have made a purchase, you will receive 3 emails; a confirmation email, a purchase receipt and then your mobile certificate. It goes to your email not your phone number. That is why we ask you sign up with your mobile email address. If for some reason you misplace or delete your email, you can sign into your account on our website and pull it from there. Thank you for your purchase. Links to your mobile certificate(s) are below. When you are ready to redeem your certificate(s), please click the link below and present at checkout. When your mobile certificate arrives, please don’t touch the red button until you are ready to pick up your item at the business. If you do, it will show as used and no longer be valid. The business will prompt you on how to validate. Please use your certificate within 90 days of purchase to be sure the item is in stock. The business will then ask you, the customer, to touch the GREEN button one time to confirm that you would like to redeem your certificate. The digital certificates cannot be exchanged for cash or traded for other items. If you purchase a gift card purchase, you will redeem your digital certificate in exchange for a gift card at the business. For certain items tax will be configured at the end of the shopping process. There are no other fees. *Gratuity is not included in restaurant certificates, so we ask you please tip your wait person.